Rajasthan Royals and Royal Challengers Bangalore met each other in the fourteenth match of the IPL 2019 in search of their first victory in the tournament at the Sawai Mansingh Stadium in Jaipur. After winning the toss, the home team elected to bowl first. After having a good start, the Royal Challengers Bangalore lost their first wicket in the form of Virat Kohli on the score of 23. Parthiv Patel stood tall as he scored 67 runs from 41 balls. AB de Villiers made 13 and Simron Hetmyer got out on a single digit on the score of 1. Marcus Stoinis made 31 while batting with Moeen Ali on 18 runs. The team made a total of 158 runs. Shreyas Gopal snapped three crucial wickets of Virat Kohli, AB de Villiers and Moeen Ali. Funny RCB Memes Go Viral As RR Hands Virat Kohli-led Side Their 4th Consecutive Loss in IPL 2019! Check Out Tweets Slamming Royal Challengers Bangalore. Meanwhile, Ajinkya Rahane got out on 22. But Jos Buttler scored the maximum runs for the side scoring 59 runs. Steve Smith made 38 runs. Whereas, Rahul Tripathi and Ben Stokes remained not out scoring 34 and 1 run respectively. With this, Rajasthan Royals went on to register their first win in the IPL 2019. Team Rajasthan Royals now stand on number six of the IPL 2019 points table with a couple of points in their kitty. Whereas, RCB still stands on number eight of team standings. RR beat RCB by 7 wickets. Check out the video of Shreyas Gopal spinning Rajasthan Royals to victory. # This is the second time Shreyas Gopal has taken the wickets of Virat Kohli and AB de Villiers in same IPL match. It was in IPL 2018 that Gopal claimed the wickets of Kohli and de Villiers in Bangalore. # Shreyas Gopal is the second bowler to do so after RCB’s current bowling coach Ashish Nehra. # RCB suffered a fourth consecutive loss since the start of the season. # This was Virat Kohli’s 100th appearance as a captain against Rajasthan Royals. After the match, Shreyas Gopal said that he was lucky to have gotten wickets of stalwarts like Kohli, de Villers. “As a youngster, it's not going to come every day and it's one of my biggest moments. I was more fortunate and our plans worked today,” he said. Ajinkya Rahane also sounded extremely happy as the team registered their first victory against RCB. 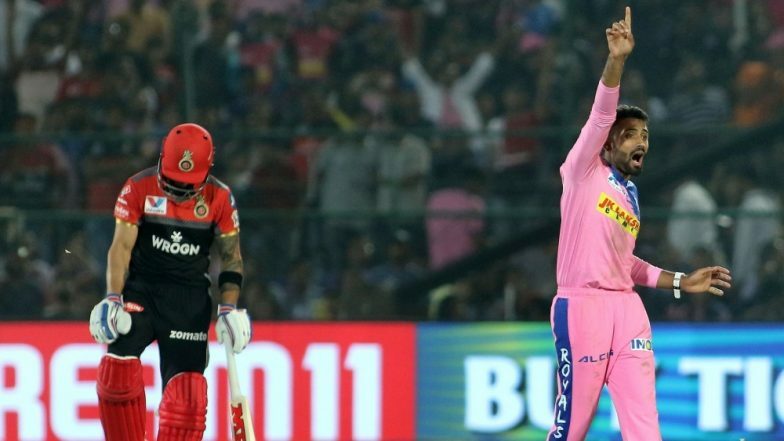 IPL 2019 Points Table Updated: RR Climbs on Number Six, RCB Remains on Eighth Spot of the Indian Premier League 12 Team Standings.